A conversation with poet and novelist Aadhavan Deetchanya on the changes that have swept the city in Tamil Nadu where he lives. In the last 40 years, Hosur has been on a rollercoaster. In 1973, this Tamil Nadu town on the border with Karnataka was chosen as the site for the state's second industrial cluster. Through the '70s, a diverse clutch of companies, producing everything from trucks to garments to medicines, set up factories here. Hosur began to emerge as one of India's new manufacturing centres. In the decades that followed, however, the town did not live up to its initial promise. Its boom in manufacturing ended and was replaced by another – one that pivoted around real estate. It was a complex trajectory. Not only did the boom and bust engender different winners and losers, they also impacted the town's caste, religious, political and social structures in different ways. Hosur's experience is relevant today. As the previous story in this series reported, struggling companies in the state's industrial clusters are trying to cut down on their labour costs. It's a script that played out in Hosur about 20 years ago. As the town’s fortunes rose, fell and then rose again, one of its residents, observed the changes closely. In Tamil Nadu's literary circles, poet and novelist Aadhavan Deetchanya is well-known for a set of satirical stories he has sited in two imaginary lands – Liberalpalayam and Kakkanadu. Kakkanadu means potty land. In four stories located here, Deetchanya inverts our society that condemns scavengers as outcasts, and reimagines a society where scavenging is the most sought-after profession. In Kakkanadu, manual scavengers – who clean up human excreta – live in houses larger than the president's. They get paid more than him. Here, it is the person unskilled at scavenging who is scorned. Unlike our society, where someone who doesn't study well will hear: “You are only fit to clear garbage.” In Kakkanadu, people will be told, “You are only fit to be a judge or collector!” It is a society where everyone wants to be a manual scavenger. Even the president quits his job to become a scavenger. Excerpts from a six-hour chat on Hosur. When did industry first come to Hosur? In 1973. When Tamil Nadu announced its second SIPCOT [State Industries Promotion Corporation of Tamil Nadu] complex here in Hosur. From the next year onwards, factories started coming up here. Following them, people with qualifications from ITIs [Industrial Training Institutes] and diplomas came in as well. Till then, this area had been mostly agricultural – not paddy, but vegetables, horticulture and flowers which were sent to Bangalore. Hosur itself was very small. In fact, when industry started coming up here, it was seen as a punishment posting. How did the arrival of industry change it? None of these industries absorbed local labour. These were all engineering companies and the locals did not have the skills they wanted. And so, most of the people they hired were from outside. The locals gained in a different way. At that time, Hosur was too small to absorb all the workers coming in. And so, locals began renting out rooms and houses. That was the first change. Anyone who could afford to build a house built one. As many as 15 bachelors lived in one house. By the mid-1980s, a new trend had started. Employees began buying houses. They might have started work at 20. Now 27 or 28, they had gotten married. Till the early 1990s, this was a very vibrant place with new workers and industries coming in. It was a very expensive place. By the early 1990s, the rent for a house this size (gestures at his house, a modestly large flat) was Rs 5,000. This time also saw the rise of tensions between the native business community (which was running eateries and grocery shops) and the new money that came in. Businessmen came from both, other parts of Tamil Nadu and the rest of India. They entered businesses like cloth and hotels. Middle communities like the Nadars came in. As did business communities from Rajasthan and Gujarat. They got into businesses like stationery, textiles, hardware, electrical goods and tiles. How did this industrialisation affect caste? A ghettoisation along caste accompanied industrialisation. People would say some areas are bad – which meant Dalits lived there. Workers came in only to work – they did not leave their caste behind. In Ashok Leyland, there was a group called the Kanyakumari group. They were mostly Nadars. They are the ones who brought in the RSS. People from each geography would organise get-togethers. These were essentially caste get-togethers. The Vanniyars formed something called the Pallavar Vizha. Did this ghettoisation emerge over time? Or was it there from the start? Not when the workers were bachelors. They lived together in the same room. They cooked together. In the first week of the month, they would eat mutton, and then move to chicken, then fish and then, by the end of the month, beef. Because it was the cheapest. There was no taboo. This was partly due to the bachelor life. And partly due to the lack of permanent jobs. We see the 1980s as an age of direct employment. But it was also a time when companies would hire workers as apprentices or pre-trainees – non-permanent staff. A vacuum cleaner company, for instance, used to employ people for 179 days, lay them off, and then hire them back again. All this resulted in worker struggles. The culture that was created in the process was egalitarian. However, as workers got married, caste came back into their lives. The earlier intermixing had not been based on Periyar's ideology or anything, only on living conditions. With marriage, workers again began behaving in line with their caste. If only because their families were not trained to look beyond caste. This was also the time communalism was coming in. The RSS was already here. 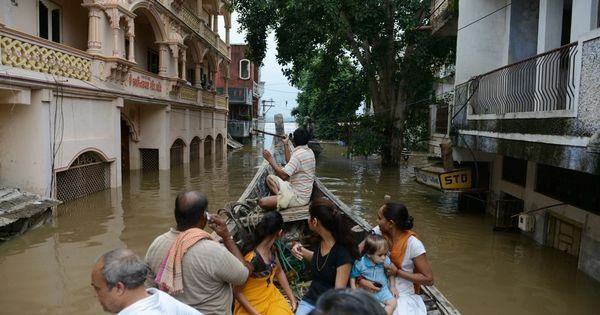 Not just through the Nadars – they were instrumental only in bringing RSS to the urban areas. A company called Knitwell Needles used to accommodate RSS cultural meets every year on their campus. From 1985 onwards, an RSS man called Senthil Kumar had been working in rural areas. He had been sent here to look after Hosur and Denkanikottai. The man has caused two riots. And the RSS has now come to a point where it could organise more than 600 pandals for Vinayak Chaturthi. Why did the RSS come in here? Hosur, given its location at the periphery of Tamil Nadu, has been more affected by the politics of Karnataka. You have to remember that this was a time when large processes were underway in the country – the Ayodhya movement would start by 1989, the Shah Bano verdict had come out. The changes in Hosur were a part of a larger communal process. Denkanikottai [near Hosur] had a famous dargah. It was a good place for the RSS to mobilise Hindus against Muslims. In 1985, for instance, a RSS leader called Ramagopalan made a fiery speech telling Hindus to only buy from other Hindus. We used to mock him, saying that after making his speech, Ramagopalan took the Rahmania bus back. All this coincided with the kar sewa movement. When the RSS went asking for bricks, people did not understand the politics that was underway. They just wanted to build the temple. And then, Advani and Ashok Singhal's rath came to Denkanikottai. That was around 1990. There was a shootout in which a lot of people died. But the police said only four did. How did liberalisation affect Hosur? The first impact was on small and medium units. Companies like TVS used to subcontract a lot of manufacturing to these units. Now, they were told to produce at a global level. Even companies making stickers were told to comply with ISO standards. Most of them could not comply. And so, the bigger companies began sourcing components from outside Hosur. That is when industries began to close. Uma Mageshwari Mills shut down saying there is no level playing field. Its employees, scared that if they went home the company would take away the machinery, set up pandals (tents) right at the factory gates and stayed put for months. The trade unions were missing. The labour department was missing. The workers tried everything they could to save their jobs. They made speeches, went on hunger-strikes, climbed on a cellphone tower, drenched themselves with kerosene and threatened suicide. They sat outside the gates for years together. Nothing happened. Slowly they started playing cards. And then it became a place where they would gather to play cards. What does that transformation in them tell you? How long do you gather? And whom do you do all this for? There was no management and the government was not paying attention. There was a psychological change here. Someone who had gathered to struggle transformed into someone sitting around to play cards. The workers colony that came up in Hosur around the Ashok Leyland plant. (Photo credit: M Rajshekhar). What happened to the workers at this time? Also, what had happened to the trade unions? In the first phase, at least half of all the major companies and a larger (if unknown) percentage of smaller companies shut down. Others fired their workers and re-hired them as contract labour. A third set of companies began getting their labour from manpower supply companies. On the whole, there was a squeeze. People could stay or leave. But many had come here in the 1980s. They had married and bought a house. By 1991, they had a wife or husband and children. And they did not know what to do. The trade unions were confused too. Whom do you fight when the units themselves are shutting down? How many fights do you fight? This period lasted between 1996 and 2000. People began selling their houses. Outsiders, from Bangalore and elsewhere, began buying up these houses. In the industrial areas, an exodus started. Thousands of workers – and their families – left. The population of Hosur began to fall. In the early days of liberalisation, we had felt an euphoria – if you know English, you will be able to get a job anywhere in the world. That began to die as these changes sank in. We saw a breakdown of families. How does the man who lost his job explain to the family that he is not at fault? He was just a small piece in this global phenomenon. We saw suicides. Men would walk out of their homes at night and sleep under streetlamps. Or hesitate to go home. Among the workers who got squeezed but did not lose their jobs, there was a disillusionment with trade unions. They went into a self-preservation mode. It no longer mattered what degradation they faced or what work conditions were like. They also began to realise they could not rely on industrial employment. And so, they began looking at additional businesses opportunities. Which was real estate. Yes. By this time, Bangalore was becoming unaffordable. Hosur, just down the highway, saw new colonies with names like Nakshatra Fields and Cloverfield come up. We also saw the rise of companies like Bangalore's Mantri group and local ones like AVS. Workers began working as agents for them, informing them about likely land sellers or home buyers. The irony is that in an industrial town, industry failed but real estate took off. That is the tale of the workers. What happened to the people who used to live here even before industrialisation? Some employees in Ashok Leyland and TVS had bought acres of land and cut colonies for their colleagues. Now, people in the town began doing that too. 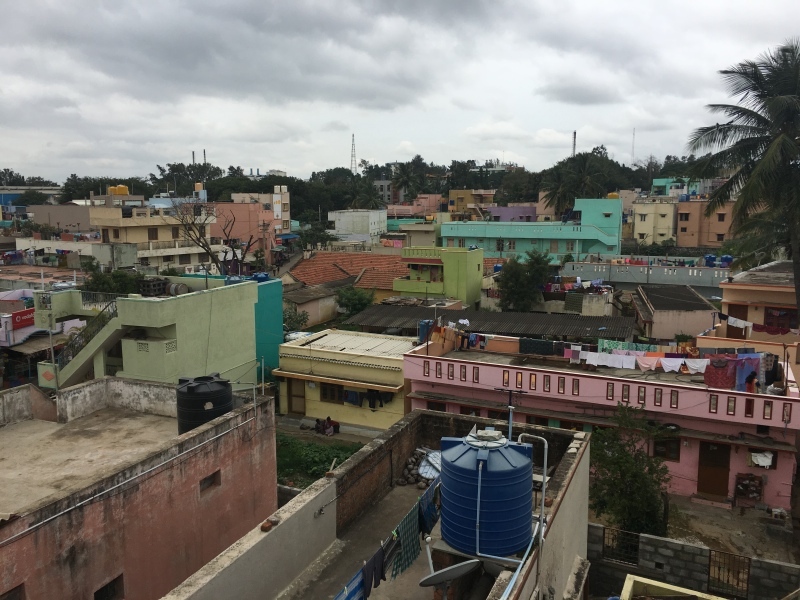 At the same time, traditional land owners sold some of their land as well and began settling in Bangalore. Houses in Hosur. (Photo credit: M Rajshekhar). It is aspiration-based mobility. They have land here but see better education and living conditions there. That was the land owners. Others began going there as construction workers. Every morning, the Salem-Bangalore train fills with a large number of people heading to Bangalore. In their place, people from North East – and North – India have come to constitute the workforce in Hosur. Last Diwali, for the first time, hawkers and roadside vendors started selling their wares in Hindi. At the same time, local people have also been removed from their lands, as happened when the state government announced an SEZ [Special Economic Zone] in Byramangalam. At that time, local political leaders began acquiring land from farmers to sell it to others. At each stage, there have been different winners and losers. When industry came up, workers gained more than the local Scheduled Castes or tribals. And then, when the industrial boom ended, a new set of winners seem to have emerged. And so, if you compare 1980 and 2015, has land moved into fewer hands? A lot of the land here is now owned by party leaders. An accompanying trend is a rise in violence. There is rising competition amongst real estate sharks. When the market was not so developed, ancestral property was divided within a family. But now, given these new rates, we see more violence over land. The brutality has gone up as well. That is because land is becoming big money. You certainly need political protection to do real estate now. This is true for other businesses as well. Now, whatever business you want to establish, you need the political class. Business ownership in Hosur is gradually moving to politicians if large money is to be made. Earlier, they would service even a common person and extract a commission. But now, they want to amass everything. That sounds like a very small number of people now control Hosur. The companies are only interested in work. They do not get involved in these issues. CITU [Centre of Indian Trade Unions] and AITUC [All India Trade Union Congress] are almost extinct. Instead, we have manpower supply companies. Trade unions had made this town liveable. They gave it soul. 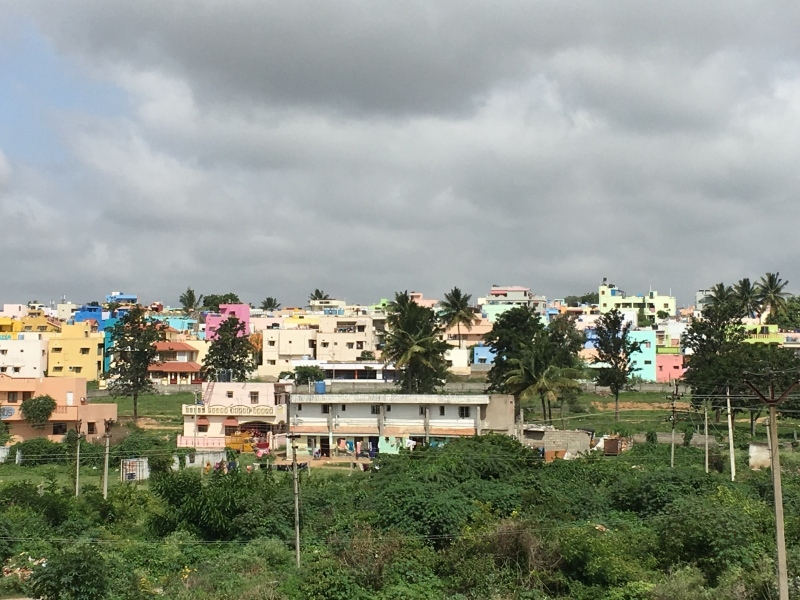 Hosur was seen as a good-for-nothing town, a place where people just came for work. Trade unions created a town-wide sense of working class solidarity. But now, the Left is almost non-existent. That holds true for the Congress too. Hosur was seen as a Congress bastion. If its leaders had run a real Congress discourse, if they had followed a secular narrative, the RSS could not have cropped up. But they were running the party, not running its politics. At the same time, the people who came from outside did not claim ownership of the town. They bought land but did not look at Hosur with a sense of belonging. Even today, there is no forum where we can talk about a plan for the next 10 years for this town. There is a cultural vacuum. And that is getting filled by a lumpen element – a religious element. It's now present in trade, politics and religion. The political class gets its money from granite quarrying. We have seen forests cut down for mining. The place is getting hotter. The groundwater levels are going down – 1,000 feet and more. Explain this bit about the cultural vacuum? What are the social institutions in Hosur? There is no ideology, no political idea. This is what happens when a society has been sedated. Earlier, whenever we organised a writers' conclave, we would meet a 1,000 people and collect Rs 100 from each. And then, it became about meeting 10 people to get Rs 10,000 each. And now, we need to find two people who can give us Rs 50,000 each. We are moving from the realm of readers to that of the sponsors. We have stopped these conclaves. And there is a loss here. A lot of things are happening. And to place those, we need a platform. We used to screen Anand Patwardhan's films. Ram ke Naam was screened here. A thousand people would come and see those. That is the change. Earlier, when we tried to raise Rs 100 from a person, there was an honesty in that transaction. That is not there any more. When the slowdown happened, and workers we used to see in uniforms now began to be seen at the bus-stand selling fruits, that was a scarring image. When you step into that realm of doing something for a cause that is other than your family – to create an alternative idea or something – the first thing that strikes you is that some money will go out of your pocket. The rationale for disengagement with anything which doesn't affect you starts from there – “What else can do I do with that money?” People get more self-centred. One would think that people closest to the edge will be the ones looking for alternatives. But you are saying they are the ones least likely to. It is very difficult. People trying to survive will not get radicalised – not without a push. And the biggest push is coming from the right wing organisations.